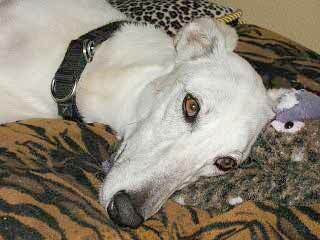 Pacer came to GALT as a stray from the Denton County Humane Society. His history is unknown, as is his age since he is not tattooed; however Dr. Jeff Ellis estimates him to be about 16 months old, as of 2/1/03. 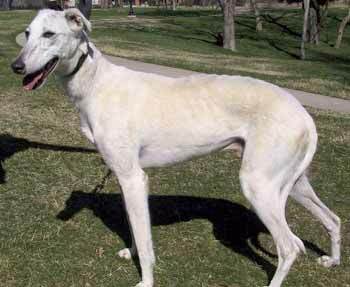 Pacers color is unusual for a greyhound, almost a buff color with hints of light grey brindle on his head and back. 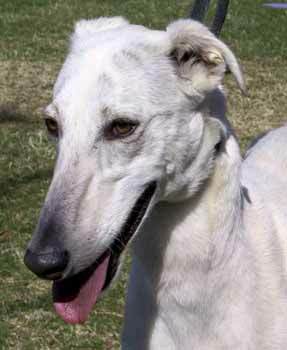 Remarkably, Pacer is heartworm negative, but has Ehrlichia in its chronic stage. We expect a full recovery, but it will be a lengthy one for him, with steady medication and treatment. His neutering will have to wait until he is much improved. Pacer is very sweet and a slightly shy boy. He is settling into his foster home at this time and seems to be adjusting. While he is a little unsure of new people, Pacer is warming up and learning to enjoy lots of love and attention from his foster mom and dad, Kristin and Lewis. As his medical treatment progresses and he feels better, his true personality will emerge. Pacer has completed all his surgery and his final round of medications, so it is time to find his forever home!! 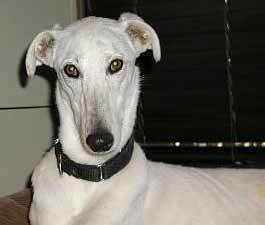 Pacer lives with several greyhounds and a cat and gets along well with everyone.